‘Ready?’ enquired Sheila, coming in to look her over. She herself was highly coloured, with dark curls, wet lips, green earrings and a full bosom. She wore a green gown and her black coat with civet cat collar. Oh, Miss Spence, you do look lovely!’ cried Alice. Sheila didn’t know what to say about Alice. Her reaction is unsurprising because poor Alice, the central character in Dorothy Whipple’s short story A Lovely Time, definitely does not look lovely. She is wearing a black dress which hangs from her shoulders just as it hung from its hanger. 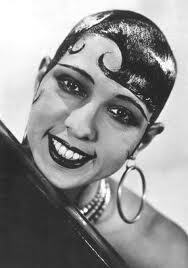 Josephine Baker in the late 1920s. Beneath it she is wearing her new woolly vest, with a piece cut out of the top so it will not show (but it does, as we discover later in the evening). Over the dress she places what she considers the crowning glory of her outfit: a strawberry pink, artificial satin cloak with a ruched collar, hand-made by her sister. 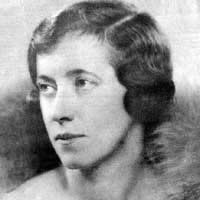 She has used lots of powder, lipstick and eyeblack on her face, but doesn’t know what to do with her hair – so she lets Sheila persuade her to go for the Eton Crop look, plastering it with borrowed Stickit (which is like boiled starch) which causes the hair at the back of her head to rise’ like a stiff hackle’. Alice comes from Ilkeston, but since moving to London she has taken to calling herself Alys, to rhyme with knees. Her job in an office barely brings in enough money to pay the rent for her small, cold room, and there is little left over for food, and none for luxuries. She never goes out and has no social life, since she has no friends in London. So she is delighted when Miss Spence (the girls in the lodging house address each other very formally) asks her to make up a foursome with two men for a night out, with dinner at a restaurant, and a trip to a night club. She sang as she took off her work-a-day clothes. Fancy Miss Spence asking her! It was most kind, because she hardly knew her really and yet she called her darling and asked her out to dinner and a night club. Oh, London life had begun! She had been lonely, she had been dull, she had been cold and felt the food at Vale House inadequate, but now the lights had gone up, the fun, the excitement, the experience she had come for were going to begin! What Alice doesn’t realise is that she is ‘Hobson’s Choice’, and has only been invited because another girl can’t (or won’t) go. She has no social graces, no style, no conversation, and is shy, inexperienced, and unsure of herself, so an evening with Sheila and her smart men friends is bound to be a disaster. 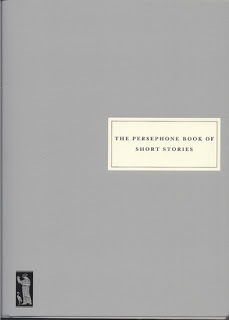 In some ways, although their lives are very different, she reminded me of Julia in EMDelafield’s Holiday Group (another of the tales in The Persephone Book of Short Stories), desperately trying to convince herself that everything is wonderful. On the face of it Alice is more naive, but when it comes down to it she is a realist and is better able to face the truth about herself and her life, even though she is left bitter and disillusioned. She may fool her family back home, but she can’t fool herself.